To walk safely in the hills some basic navigation skills are needed. This section will describe some of the skills needed. It should be remembered that there is no substitute for experience, and all skills should be practiced regularly. By working through each section in turn you should pick up enough skills to be able to navigate in poor visibility, use the map effectively, plan a route, and leave a suitable route card for a walk. The map is the main item needed for navigation. There are several types of map, however the ones recommended on this site are the Ordnance Survey (OS) Outdoor Leisure and Landranger series. The Outdoor Leisure is a scale of 1:25,000 which covers most of the mountainous areas in the UK, whilst the Landranger is a scale of 1:50,000 and covers all of the UK. Maps are available in laminated and non-laminated formats. If you can afford to spend double the money on a laminated map it is well worth while, since they last a lot longer when used in poor weather (which is when they are most needed) and do not need a map case (which makes using the map more difficult). Whether you are using 1:50,000 or 1:25,000 a square on the grid will always represent 1 km. This means that a diagonal will represent approx 1.5 km. This allows easy estimation of distance on the ground. The map consists of a series of squares such as those shown below. The numbers are used to give a grid reference. We read along the bottom followed by the top, so that in this example 2307 would refer to this 1km square area. This is not really sufficiently accurate to pinpoint your position, so the square is divided into 100 smaller squares. 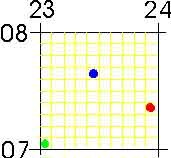 Now each small square represents 100m square, and we have therefore got more accuracy. We call the new grid reference a 6-figure grid reference. On the map itself we do not have the yellow lines. Instead we must either estimate, or measure the tenths of the square. One way of doing this is to use a roamer scale on the compass. This is usually found on compasses at the more expensive end of the market. It is a scale at the edge of the compass. To use it take the corner of the compass where the scale starts and place it on the point which you need a grid reference for (we shall use the blue spot). Now the number of lines will give the grid reference as 234076, as before. Note you take the nearest line within the grid square. On the compass there may be several roamer scales for various scale maps. It is important to use the correct one. 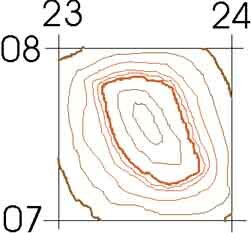 We also use the map to allow us to interpret the aspect (slope) of the ground. The contour is used to help with this. A contour is a line connecting points of equal height. 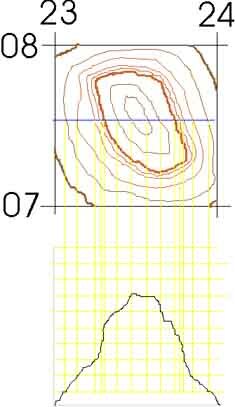 Usually the contours are at 10m intervals shown in brown, with a thicker line marking 50m. Also spot heights are used to give the height of a certain point. They are indicated by a brown dot. The height is marked somewhere along the contour. When you look at the height the right way up, you will be looking uphill. The diagram shows a set off unlabeled contours. We will briefly use these to describe the hill. At the edge of the grid square the contours are widely spaced. This indicates that the ground is not too steep. As we go up the contours get closer together, and we would find the ground getting steeper. Then as they get further apart again the ground would be leveling off. The diagram below shows the profile of the slope if we were walking along the blue line. Each yellow line up represents 10m height. The width of the profile would be 1km on the ground. A similar exercise can be carried out for other directions. It should be noted that we do not know what happens between the contours. It is possible that the ground might rise by 9m but this would not be shown. 1. The ridge where the ground reaches a high narrow point and drops off to the left and right (eg Crib Goch). 2. The valley where the ground is relatively flat, and rises to the left and the right (eg Nant Ffrancon). 3. The summit which is the example shown above. These are other features which you will come to recognize with time. With practice you will be able to relate the contours on the map to the ground and decide what is suitable for you to walk over. Care needs to be taken when switching between scales of map since the contours are closer together on the 1:50,000 because the square is smaller. The cartographer may sometimes miss out the minor (10m) contours if the ground is too steep, and you should watch out for this. Also note contours are rarely shown in quarries since the level changes (eg Penrhyn Slate Quarries). There are several types of compass available on the market. The price may vary from £10 for a basic model to £20 for a model with more scales. As a general rule the price will increase as more scales are added to the base. A typical compass is shown below. Note that there are likely to be more scales on a real compass. The first use of the compass is to orientate the map. This means that the compass is used to line the map up in such a way that the features around you are in the correct place when you look at the map. It is not always necessary (and in fact it is better not to if possible) to use the compass for this. You could use known or recognizable features around you to perform this task. For example assume you are at the cross on the map (and know this since it is a peak). You can see the lake and the peak shown on the map in good visibility. You can rotate the map so that these line up appropriately and therefore you can identify the point labeled with a star. If you cannot do this using features then you should use the compass to line up North on the map with North on the ground. The map will then be pointing the same way as if you had orientated it using features on the ground. The main use of the compass is for navigating in poor visibility. It should be used along with the techniques of timing and pacing. Here will will discuss how to take a bearing from the map and follow it. We will assume that we wish to go from the blue dot to the green dot. 1. Put the compass on the map ensuring that the base is aligned with the points which you wish to move between. The direction of travel indicator should point the way you want to go. 2. Rotate the compass housing so that the orienting lines are lined up so the red north arrow on the housing points to grid north. Note it does not matter which way the needle is pointing. 3. Take the compass away from the map, and add magnetic deviation to the bearing. At the time of writing this was almost zeroº. It varies depending on where in the world you are. It also reduces by approx ½º every 4 years. 4. Take the compass and whilst keeping it flat, rotate the whole compass so that the needle is in the center of the red arrow on the housing. 5. Looking down on the compass follow the direction arrow to a feature such as a large rock (but not a moving one such as a sheep). Now walk to this feature keeping track of the distance walked. Now find another feature in the same way, and continue till you reach your destination. 1. Point the direction arrow along the line of the wall or to the feature. 2. Rotate the housing so that the needle is within the red section of the housing. 4. Place the compass on the map and line up the housing with the grid lines. 5. The direction arrow now points in the direction of the wall, or towards the feature from where you are. 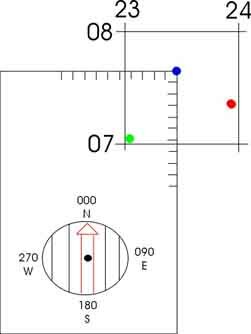 By using this technique with two (or better still three) features you can locate your position on the map. 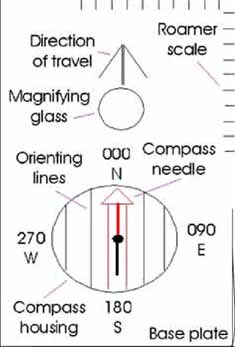 These are the main uses for the compass, and they should be practiced in good visibility so that they can be applied in poor weather when you will really need them. The most common mistake is to be 180º out because you have lined the housing up incorrectly, or pointed the compass in the wrong direction on the map. It is best to guess the bearing first and this mistake will then become obvious. It is important for us to know how far we have walked in poor visibility, and also to know how long a walk should take us. For these reasons it is important for us to be able to look at the map and have some idea of how long a certain leg of a walk will take. It will also allow us to vary the route if we are going slower than expected. The speed of walking will vary with conditions both above and under foot, and this needs to be allowed for. When calculating timings it is usual to use Naismiths Rule. This allows 5 km per hour with 10 min for every 100 m climbed. This applies to a fit adult. When walking with a mixed group it is usual to allow 4 km per hour. If going down hill, you should add an extra 10 min for 100 m descent if the ground is very steep. If it is a gentle slope you may subtract 10 min for 100 m descended. Generally I do not subtract time for down hill and find it works out reasonably well (but I do add times for steep sections). Calculating from the above we are allowing 12 min to walk 1 km and 1 min added for every 10 m climbed. This is a good estimate, and can be used along with the map to plan a route. Rest is usually added at 10 min rest for every hour of walking. This does not generally allow for prolonged photo stops or lunch. You should now be able to measure a distance on the map, calculate the height gain, and work out how long the section of walk should take. This will, as with everything else, improve in accuracy with practice. In poor weather the timing can be used to calculate how far you have walked. Using this in conjunction with the compass will allow accurate navigation. To be even more accurate over short distances pacing can be used. You need to know how many double paces (one double pace occurs each time the same foot touches the ground) you take for 100m. I am fairly tall and usually take approx 65 on flat ground. Pacing should be tested on several types of ground, such as rough ground and going up hill so that you are aware of the differences from walking on flat ground. Knowing that one grid square (40 mm on the 1:25,000) is 1 km we can state that 4 mm is equivalent to 100 m (65 double paces) and therefore 1 mm is equivalent to 25 m (16 double paces). This can now be used to measure distances on the map and accurately convert them to distances walked on the ground. It may be useful to keep beads on the compass string, to mark off the number of 100m walked, since it is all to easy to forget when pacing for real. There are two main purposes for the route card. The first is to leave with a responsible person so in the event of your being overdue they can alert the rescue services. If you are back always make sure they are aware, similarly if you have changed your plans and will be late back, since this avoids un-necessary call-outs. The second is to give you an idea of how long sections will take, and allow you to adjust your route depending on time and conditions. 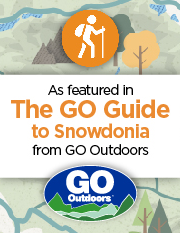 The description below is the type of route card I use in Snowdonia. Additions for walking with groups in other areas may include the noting of escape routes. The link is to a Microsoft Word document with an embedded Excel worksheet used to calculate the route. This next section should be read in conjunction with it. The first line is the date for the walk followed by the start time and the party. These are self explanatory. To open the route double click on it. The speed should be entered in kph and this is used for the rest of the plan. Finally the latest time of arrival can be entered.